In 2010, the Chinese New Year coincided with Valentine’s Day. There was a huge celebration at the Hongkong Ocean Park where it was named the Sweetheart Chinese New Year. This year Valentine’s Day happens to fall on Chap Goh Mei (15th night) which is the last and final day of the Chinese New Year celebrations. Chap Goh Mei is a big celebration among the Hokkiens (Fujianese) in Penang, Malaysia. It is considered by some as the Chinese Valentine’s Day. In times past, this was the only day young maidens were allowed to go out at night. Young men would also go out to catch a glimpse of the rarely seen maidens. They would usually congregate around bodies of water. The maidens would throw Mandarin oranges inscribed with their names into lakes or ponds in the hope of landing a husband. It is believed that the young man who fish out the orange would be her future husband. This tradition has survived to this day and it is a fun way to mark the end of the Chinese New Year festivities. 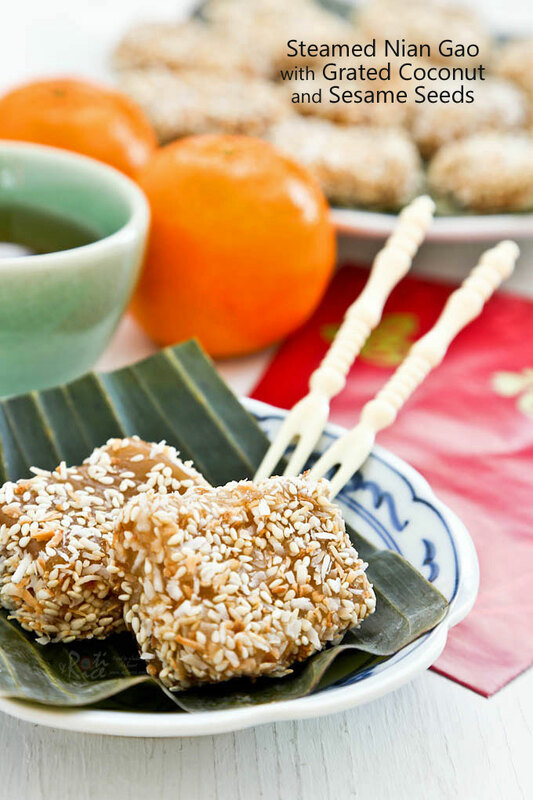 While Mandarin oranges are a favorite for the Chinese New Year, nian gāo (年糕/New Year Cake) is a close second. Since I have long found my “match”, I turn my attention to making a simple dessert for the occasion instead. 😉 Fresh nian gao (or ti koay as it is known in the Hokkien dialect) can be rolled in lightly salted grated coconut. If the ti koay has hardened, it should be steamed for a few minutes to soften. Lining the steaming dish with banana leaves imparts a nice fragrance to the ti koay. 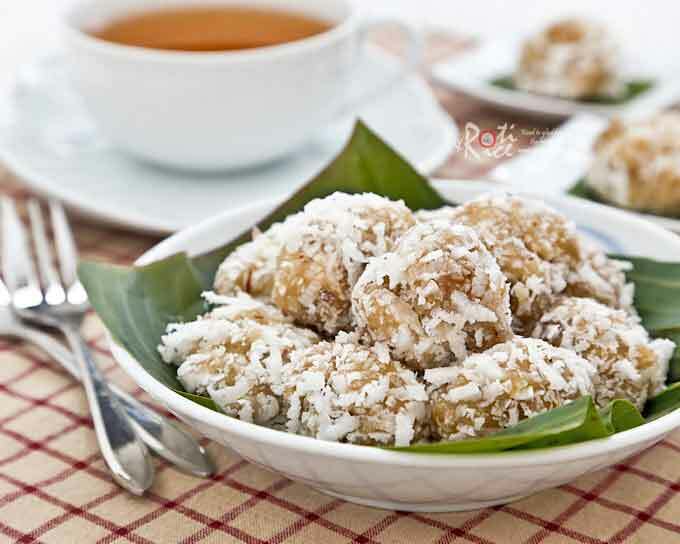 In the recipe below, I have decided to use a mix of toasted unsweetened dried grated coconut and sesame seeds as freshly grated coconut is hard to come by here. I must say I am very pleased with the results. Place unsweetened dried grated coconut in a fry pan and stir over low heat for 2 minutes or until lightly toasted. Do the same with sesame seeds. Mix the two in a shallow bowl. Set aside. Place nian gao cubes on plate lined with banana leaf. Wrap with aluminum foil. Place in the steamer, cover with lid, and steam over medium heat for 10 minutes. Remove steamed nian gao from steamer. 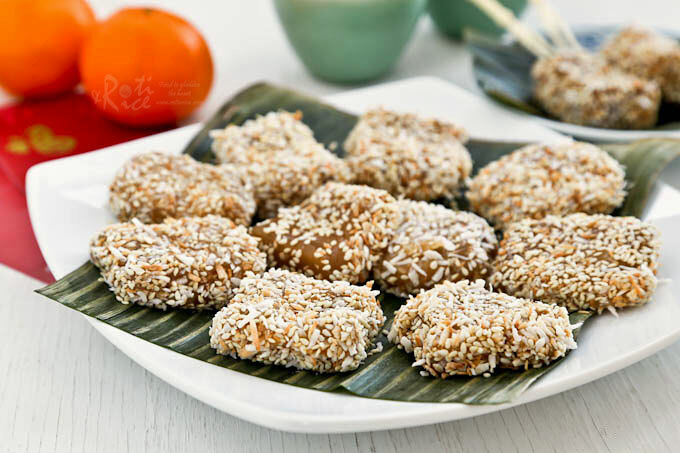 Using a pair of chopsticks or a fork, pick up a piece of sticky nian gao and roll it in toasted coconut and sesame seeds mixture. Repeat with remaining nian gao. 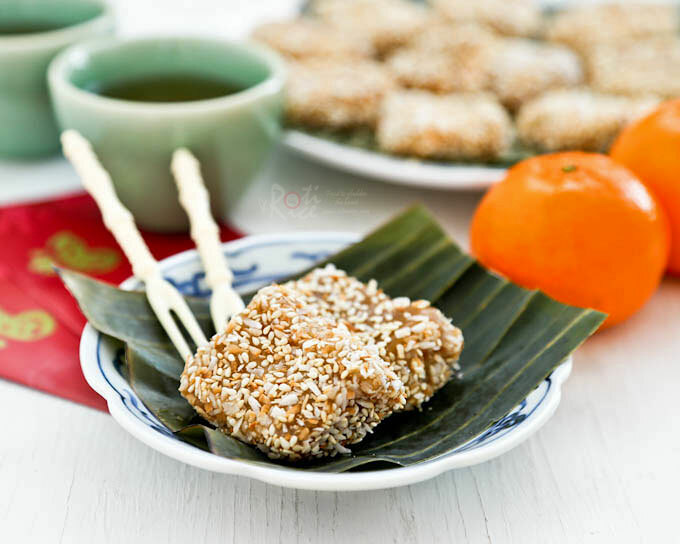 Steamed Nian Gao with Grated Coconut and Sesame Seeds is best served warm with a cup of oolong. Here is the original version with lightly salted grated coconut. You should try both versions. You will not be disappointed. Soo these look mouthwateringly amazing! Such a wonderful texture of the nian gao and the crunchy topping, yummmm. I will definitely try to make these for next new year!